1 of 4 WALL ILLUSTRATION WORKSHOP Two artists from Kartal executed wall illustration workshop with the children of Kartal. They reflected Kartal in their mind to the wall of TAK Kondu. Photo courtesy of TAK Kartal. 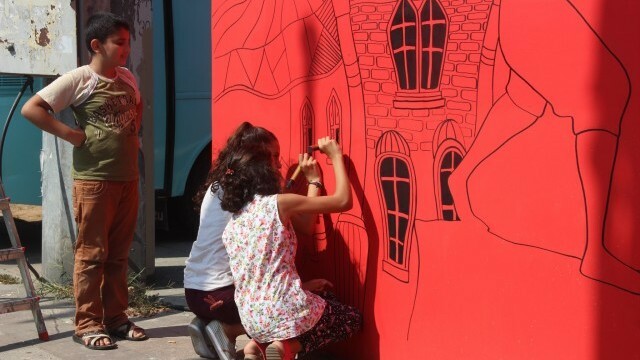 Two artists from Kartal executed wall illustration workshop with the children of Kartal. They reflected Kartal in their mind to the wall of TAK Kondu. Photo courtesy of TAK Kartal. 2 of 4 DESIGN TAK Children made their own lantern for the torchlight procession on Republic Day celebrations with GOM which is a kit of paper modules to be used for design and construction of 3D shapes. Photo courtesy of TAK Kartal. Children made their own lantern for the torchlight procession on Republic Day celebrations with GOM which is a kit of paper modules to be used for design and construction of 3D shapes. Photo courtesy of TAK Kartal. 3 of 4 SHOCK CORNERS BORDERS In the unused corners borders of Kartal with the concept of “design onsite, apply colectively” 5 designers and 5 neighbors, with 5 tools in 5 hours create solutions to an urban problem, revive corners and borders. Photo courtesy of TAK Kartal. In the unused corners borders of Kartal with the concept of “design onsite, apply colectively” 5 designers and 5 neighbors, with 5 tools in 5 hours create solutions to an urban problem, revive corners and borders. Photo courtesy of TAK Kartal. 4 of 4 ADDING (+) and SUBTRACTING (-)METHOD Add (+) and Subtract (-) is a way of summing up inhabitants’ problems, subtracting prior problems and developing common solutions with designers and inhabitants. Photo courtesy of TAK Kartal. Add (+) and Subtract (-) is a way of summing up inhabitants’ problems, subtracting prior problems and developing common solutions with designers and inhabitants. Photo courtesy of TAK Kartal. Kartal is one of the municipalities of Istanbul, an industrial area located in the Asian half of the city. Most of its 460,000 residents come from other parts of Turkey, and moved to Kartal for better job opportunities. Kartal now is aiming to revitalise its former industrial sites and other abandoned or underused areas within the municipality. Istanbul as a whole leads Turkey’s cultural sector, and has a rapidly developing economy. However, economic development has led to an increase in property prices. People in the creative sector, including designers, are now having trouble finding spaces where they can work. Tasarım Atolyesi Kartal (‘Design Atelier Kartal’– abbreviated as TAK Kartal) is a creative innovation space that brings together Kartal residents, designers, volunteers, students and supporters to collaboratively create ideas and products for the public good, finding solutions that can improve the quality of life in Kartal. It has thirteen different design, research and participation programmes. It is a public/private partnership between the Municipality of Kartal, which finances the project; the DESTEK Platform, an advisory board of 250 designers; and Kentsel Strateji, a private company founded by the two designers who developed the idea of establishing TAK Kartal. 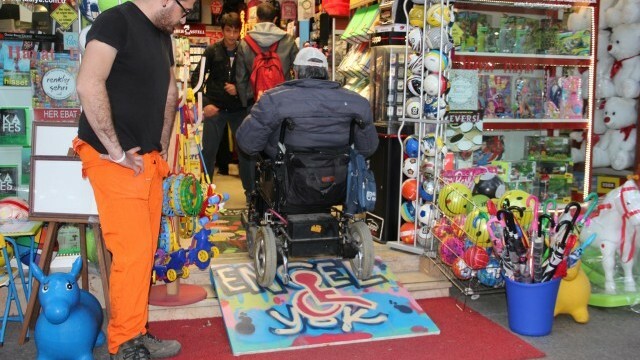 Kentsel Strateji manages TAK Kartal’s ateliers on a voluntary basis as part of its social responsibility programme. At the centre of TAK Kartal is the idea of making space for designers. It includes a number of spaces provided by the municipality of Kartal, ranging from studios to more innovative solutions. TAK Gezici is a mobile design atelier, housed in a bus, that helps to expand the influence of TAK Kartal. It allows designers to come to together with local people in their own neighbourhoods to listen, discuss issues, and collaboratively develop solutions to local problems. TAK Kondus are portable and expandable modular units that function as a meeting point for neighbours. They will be placed in a number of neighborhoods in Kartal. Though many designers participate in TAK Kartal, the city has recruited five designers (including architects, city planners and graphic designers) to work full-time on the project over two years. TAK Kartal’s thirteen design, research and participation programmes have been developed in a participatory way, with contributions from residents and designers. They have a wide variety of aims, from increasing knowledge about archaeology to developing Kartal’s food culture by sharing recipes. TAK Kartal runs events including short film workshops, movie screenings, seed bomb workshops, wall illustration workshops, an urban chess event, and code workshops for children. Participation has been high, with involvement from 450 designers and 1700 participants. 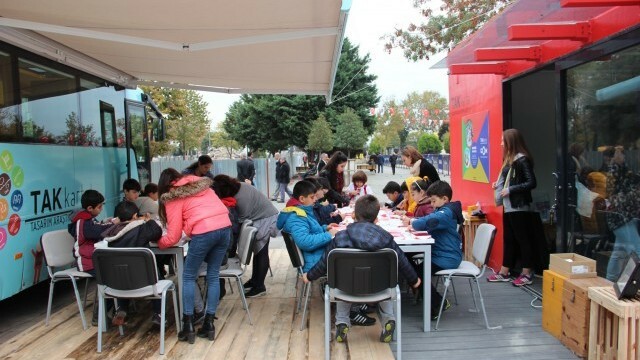 One of its more notable programmes is Corner Borders, which aims to regenerate abandoned and unloved places in Kartal, while giving residents a say on the development of their neighbourhoods. Residents and designers collaborate to propose potential abandoned places, and TAK Kartal makes an open call to the public and designers to submit proposals for projects. The top three projects are chosen by a public vote, and of these, the municipality of Kartal chooses one to fund and implement. For example, TAK Kartal made an open call for projects to improve the unused space in front of the Kartal Tax Administration Building. The winning project came from a private architecture firm, which redesigned it as a space for street artists and vendors, and a green spot where people could wait while they were completing their business in the tax offices. The project was financed by the municipality and the new park has now been opened. There is also a Shock Corners Borders programme, which features design projects which can be implemented in just twenty-four hours. It has created birds nests, doghouses, wheelchair ramps and street furniture, which are now actively in use by the people of Kartal. A long-term target is to implement the “20 Neighbourhoods 1 Kartal” Neighbourhood Action Plan. 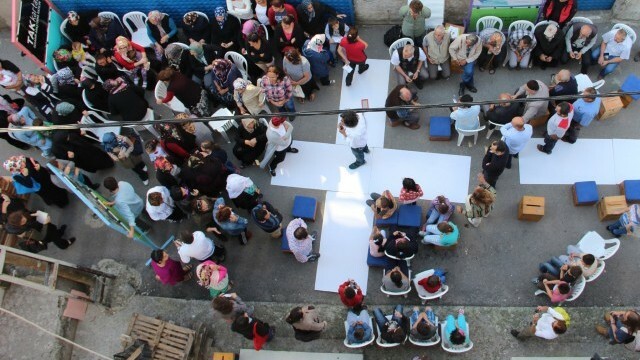 This plan evaluates the issues, opportunities and development capacity of Kartal’s neighbourhoods, and sets out fields of action and programmes to create more liveable neighbourhoods. • One of the greatest challenges of the programme has been the fact that Kartal’s residents have little experience with working in groups. But the innovative, mobile spaces of TAK Gezici and TAK Kondu have made it possible to engage with residents who have little or no access to cultural spaces or previous participation in cultural events. Awareness of TAK Kartal is now increasing, as is familiarity with its participatory approach. The project has helped to develop a new relationship between citizens and local government. • Using a Social Impact Design methodology has been one of the main keys to the success of the project. Social Impact Design is an approach that aims to gain in-depth understanding of the dynamics of a neighbourhood and its inhabitants, using human-centred design principles that develop solutions by centring the user. It generates change by taking inspiration from people, investigating real problems and developing tangible solutions. Design thinking could be applied even more broadly as part of TAK Kartal in the future.